Look, another week where I posted nothing between the Friday updates. Hmm... I've really got to get on the ball here. It was another week of planning changes and we added yet another activity, except it was canceled this week. First, before the imminent change and new activity, because they are related, how about what actually did happen this week. It's Missouri, and it's this crazy winter that everyone is having. You know that means it snowed here again. After ice last weekend we received another 5 inches of snow to add to the mounds of plowed snow in the Target parking lot. I think we are trying to create our own glaciers because the mounds just keep getting bigger. Fred stayed home from work on Tuesday, the day the snow arrived, because even though it was forecasted, the roads weren't treated properly and no routes were safe. Amber, mistakenly thought this might mean a day off of school. Unfortunately for her it snowed off and on all day and didn't really accumulate enough for play until it got dark. Fred also worked from home all day with conference calls and everything. (TOP-L) All three cats mesmerized by the snow. Rosetta (center) watched for hours. (BOTTOM & RIGHT) By bedtime it was almost at 5 inches for the day. I love snow, but I'm glad we homeschool. The kids around here will be having school until July at this point. We actually held ALL of our school upstairs in the loft room where our desks are so that Fred could have the downstairs undisturbed, except for the cats who thought it was play day since he was home. Amber and I even ate our lunches upstairs at her desk because Fred was on a conference call at the time. It was a fun, picnic kind of lunch. Instead of fending off the ants and bees, we had to defend our food from the cats. While they know the kitchen table is off limits, they are normally allowed on Amber's desk. Mayhem ensued. Amber accomplished *almost* every lesson I planned for the week. I'd like to think that she is increasing her work load, slowly. In truth, I think I'm just being more realistic in my lesson planning. At any rate, only one logic lesson and one Writing With Skill lesson were pushed to next week. Today, Friday, is another one of Amber's "Fun with Mom" days. It's part of the Christmas coupon gift I gave her. She gets one school day a month to select as not only a day off from school, but a fun day with Mom too. We do whatever she wants, within reason. I was hoping she would enjoy this gift, but I had not expected it to be the huge hit that it has been. It's not the days off school, but the playing together that she enjoys the most. To be honest, it's a huge gift for me too. 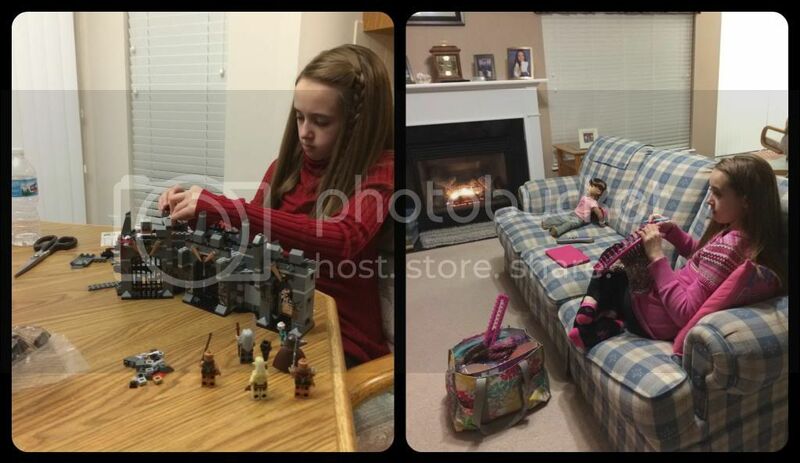 (TOP-LEFT) I can always tell the subject by how she is sitting. On her feet means a lot of reading. Literature in this case. (BOTTOM-LEFT) That's our "inbox" for Mom. No, I'm not behind in grading at all. (RIGHT) Snow day math with the remnants of lunch - peanut butter bites. Amber snacked all afternoon. I wasn't going to argue since she was eating. Amber has been a little puny all week and it looks like another intestinal cleanout is in order for today. Good thing we were staying home to play. It also looks like the previously safe green beans might have caused a slight reaction. I am hoping it was just a case of too many foods that are only marginally safe in the span of 24 hours. It turns out the coconut milk that we thought to be safe only barely passed the first food challenge. When Amber ate the coconut milk ice cream for a second time she added low fructose cookies and... bam! Food failure. To top it off, Amber wasn't as fond of the coconut milk ice cream as the almond milk ice cream, so we have said good-bye to coconut milk. Upon further research, it looks like the coconut milk has more fructans than I originally thought. There's more proof that Amber can't tolerate fructans either. Amber's favorite part of the week continues to remain her art classes and music lessons. We have managed to move all of Amber's activities to only two days of the week. Those two days are jam packed, but keep Amber smiling all day. At the Painted Pot they have spent part of the class time for several weeks working on a mosaic that isn't finished yet. It incorporates both clay and glass, plus a new way to paint the clay. I think next session (in two weeks) they finally grout the mosaic as well as a new glass fusing project. The homeschool group art class is entirely different, but even more enjoyable - if I'm reading Amber correctly. They are learning more about drawing and the many techniques it involves. Amber especially has been enjoying the zentangle project. She was originally freaked out by the homework aspect, but now loves telling me all about her "art homework". I think she finally figured out that it doesn't have to be perfect. 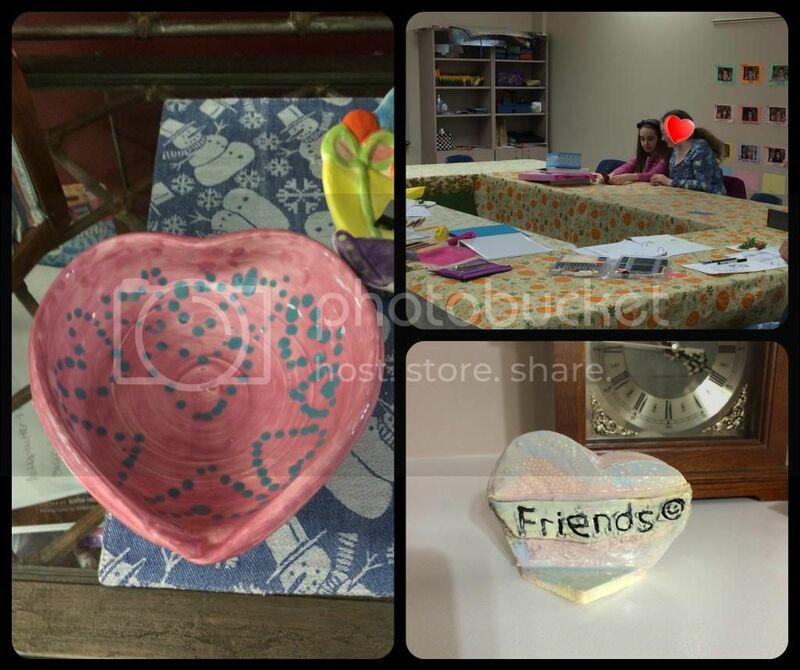 (LEFT) Heart shaped bowl from Painted Pot. They made them on the pottery wheel and have moved up from round bowls and mugs to shapes. (BOTTOM-RIGHT) Another Painted Pot project. Clay molding with a new painting style. (TOP-RIGHT) In the homeschool group art class with her friend. One happy girl. So, are you still waiting to hear about the changes? It is the very same change I mentioned that we were considering last week. Remember how I said I don't like to over think decisions? Well, this time I didn't exactly make the decision on my own. Amber was quite a driving force. Again, Fred just rubber stamped but he did it with a grin. It's hard to admit this, but Amber doesn't like our church congregation. She hasn't for ... well she never did. She was 7 when we transferred from our previous congregation and she went along with the change because it pleased me. After the issues with the associated parochial school we found out Amber's real feelings, but she was willing to stay at the church. She really did enjoy being in the chimes choir (and later the hand bell choir). Fast forward now to 12 year old Amber in 6th grade. This fall is the magic year for her; she starts 7th grade confirmation. Amber has had quite a bit of angst over this and we've had many discussions. The general gist is that Amber has no desire to be a part of confirmation at our current congregation. Yes she desired to learn more about the Lutheran church and to become a communicant member, but not at our congregation. That left me with the task of quietly looking around at the other local LCMS churches to find one I thought might fit for our entire family. I wasn't having a lot of luck, nor was I working terribly hard at the task. Then, Amber was removed from dance and we started attending the homeschool group art classes. 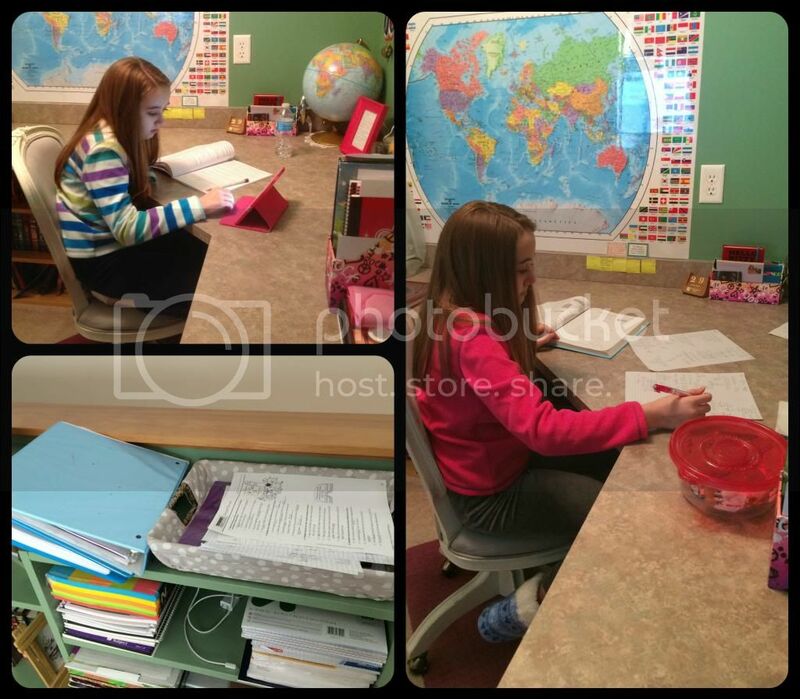 The homeschool group holds its classes at an LCMS church not far from our current congregation. Somehow this church had fallen off my radar, even though we passed it every week when Amber was still in sensory therapy. (LEFT) Building another Hobbit LEGO set she got with a birthday gift card. This one is Dol Guldur. (RIGHT) Knitting for the Heartland kitties again. Last weekend we took the plunge and visited for Sunday school and church. Amber absolutely, without a doubt, LOVED this church. She had a fantastic time at Sunday school and even promised them she would be back before asking her parents. Then she promptly spent the whole pre-service time pestering me, plus intermittently during the service. Of course the pastor had to mention that this coming weekend was the next new member welcome, so if anyone was thinking about joining that would be the time. Really? With Amber on one side of me begging to transfer and the pastor in front of us gently encouraging, I felt like God was hitting me on the head. Those of you who prayed for our decision, thanks. It worked. I really don't think I had to listen very hard at all this time. But really, transfer in one week? We talked to one of the pastors and of course it is possible to transfer in one week. So, okay there we were and the process was started. But wouldn't you know, this congregation starts confirmation in 6th grade. Umm.. right, so Amber is 2/3 of the way through 6th grade. Again, this was a non-issue. Amber can just join now for the last 4 weeks of the year. They pause confirmation classes during Lent, but Easter is so late this year it is kinda awkward to restart afterwards. Thankfully, 6th grade confirmation appears to be Bible story recap and getting their feet wet in the process of sermon notes, service hours and acolyting. Nothing for Amber to makeup. Amber was over the moon that she was going to start confirmation classes this week. I mean giddy with anticipation, even though it is now the last of three activities on one day (and none of the other activities are at church). Of course the snow changed that because the schools canceled for the day so the church canceled evening activities. Amber now is watching the weather for next week, anticipating her first confirmation class again. On a sad note, Amber chose to drop out of the hand bell choir at our almost-old congregation. She loved the bells, but the atmosphere there was never pleasant for Amber. She was tired of it. (BOTTOM-RIGHT) Matching one for her doll. This one took all of 15 minutes to make. This may not seem like a huge change to some people. Fred even went so far to jokingly call me a "church hopper". I was a member of one church congregation for 31 years before transferring to where Amber first went to school. After 5 years, we transferred to the congregation where Amber next went to school. Now, after another 5 years, we are transferring again. I hope this one sticks. It is most like the congregation where I spent the majority of my life. It is also significantly smaller than the other congregations and more comfortable for us all, I pray. 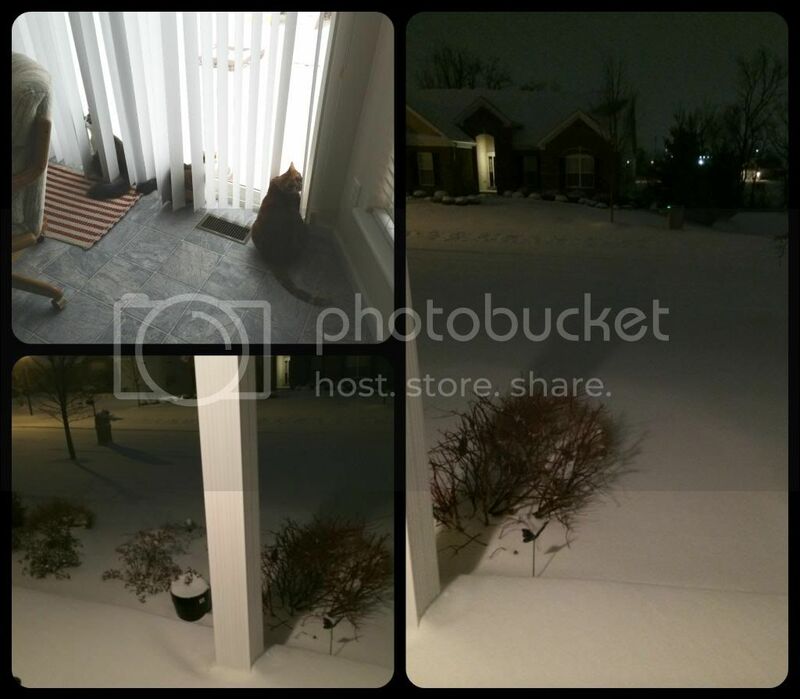 Now this weekend the lovely weather men, who always get blamed for the freakish Missouri weather, are predicting more snow Saturday / Saturday night. All I have to say is we better be able to make it to church for our new member welcome. Amber might possibly never forgive me if we don't. We have moved churches five times in our marriage (twice because of moves) and I really hope the one we have been at for the last year sticks. We really like is so much more. It is hard finding a balance with a larger families needs. I am glad it is all working out for you. I'm homeschooling an only as well- it's always nice to meet another person doing the same! How are you liking Writing with Skill? We love Writing With Skill. I was just discussing next year's plans with Amber and she wants to continue with WWS. I like to get her input and I was willing to loom around at other writing programs, but she loves WWS and wants to stay with it. We recently changed churches as well, and had a similar experience of God confirming yes this is the right choice. Amazing how that happens, isn't it? It is amazing. I would never have expected needing to remove Amber from dance for health reasons to be a blessing. But without that happening, we would not have joined this homeschool group, which has been a wonderful experience in itself. We also would not have found our new congregation. Such confirmation that all things, even the seemingly bad, work for our benefit. No snow days for homeschoolers was a topic on babycenter. Being up here in Canada I can't remember the last time I heard of a snow day being called. I am glad the prayers worked for you decision. We moved churches when we moved and it was a similar hitting on the head obvious. We had two churches near by the further one was our old one that we had been married in. We walked in there and everyone was welcoming us back as if we had already made a decision. It was the right place for us. On church hopping. At our old church mass was early so if we slept in we had to drive into town to go to a later mass. We started calling ourselves Nomadic Catholics. Then someone turned that around and said that Roaming Catholics would be funnier. I hope this new congregation is a perfect fit you and your family. What a great story! What a week! Sorry she had a reaction 8(. But Huzzah to the church and all that fell into place! It's not easy finding a church that feels like home (been there). 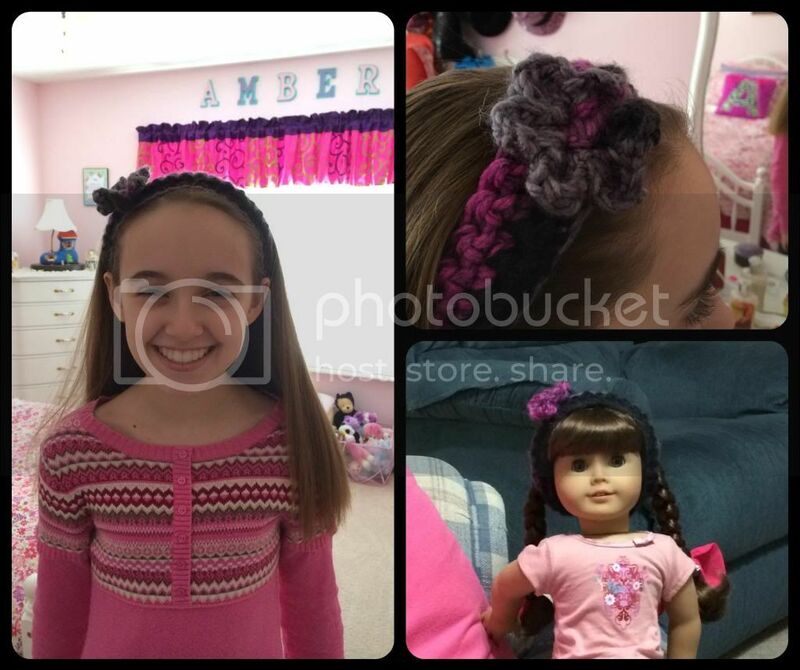 Love the headband and the doll one! I pray your weather gets better! Enjoy the weekend! Congrats on finding a church that you all feel comfortable in. That's not always easy! I hope the weather allowed for you to make it for the new member welcome. We have had enough snow and frozen water pipes here in NY. I pray that you continue to find foods that Amber likes and can tolerate. I love all of Amber's creations. She's one creative girl!